In September 20, 2008, Jiangxi Province Team won two first prizes at the group projects of Heath Qigong Yi Jin Jin and Wu Qin Xi at the Second National Health Qigong Exchange and Tournament. At the same time, members of Jiangxi Province Team Lin Xuexia and Cui Wenqiang won the first place at the Women’s Race of the Liu Zi Jue Routine and the third place at the Men’s Race of the Wu Qin Xi Routine. After the tournament, many people asked me that the secret of success. As Director of the Jiangxi Province Health Qigong Administration Center as well as a coach for Jiangxi Province Team, I have exerted every effort for this cause. Therefore, I also have too much emotion and inspiration for the vicissitudes of success. If there are any secrets for success, I just want to tell you that the success stems from strict management and assiduous training. The current Jiangxi Province Team was established based on last year’s team that participated in the First National Health Qigong Exchange and Tournament. Except for some adjustment to individual players, a majority of players are retained. Therefore, it is a relatively strong team with the experienced professional as well as proficient players. 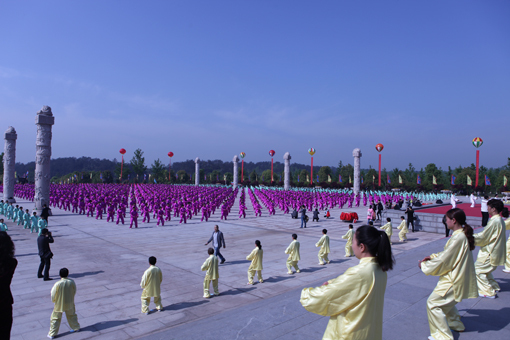 However, we clearly recognize that with the further development of National Health Qigong promotion for one year, the fraternal provinces as well as municipalities have also attached great importance to the Health Qigong and they also made substantial progress on the practitioners. Thus, we no longer have any advantage at all. The only thing we can do is strict management and assiduous training. Only in this way can we have the chance to create miracle and achieve better accomplishment. With regard to the strict management, I have always believed a proverb that a good apprentice always has a strict master. Therefore, whether for a unit or a team, if it wants to make a difference, it is necessary to strengthen management and strict discipline for the sake of relying on management to generate high performance. Thus, ever since August 21 that our team officially started closed-door training, first of all, I have repeatedly emphasized the significance of training discipline. Most of the players live in Nanchang, thus in order to ensure both the training time and the quality of training, we implemented a strict asking- for- leave& return- for- leave system and the players also gave a great deal of understanding and cooperation. During the training, we ate and lived together all day. The daily training period last from morning to evening without any weekends or holidays, and I also stayed with players in the training field all day long. Throughout the training period, we all concentrated on the training and there are very few players asking for leave. One of our players, Zhou Huasheng works in Xinyu City. In order not to delay the training, he participated in training by train every time after work and he has been insisting on this way for nearly half a month. September 14 is the Mid-Autumn Festival, which is also the most intense time. However, our players did not go back for family reunion but preferred to insist on training, and I also had a memorable Mid-Autumn Festival with them. With regard to assiduous training, the performance of team players is also moving and impressive. According to training schedule, it is required that 6:00 in the early morning is the fixed time for morning exercises, and the whole training period last for 10 hours a day. In addition, each set of exercise is mandatory to do at least 10 times so that two sets of exercise have to be done more than 20 times. Taking account into such intensity, even the young people would feel intolerant, let alone to the middle-aged and elderly people at the fifties and sixties. Nevertheless, all of us persists in training. During the 28-day training, no one quitted or complained hardships and fatigue. With this spirit of unremitting and indomitable endeavors and perseverance, we finally taste the happiness of victory. Although the intensive training and tournament was over, yet each time when I recall this experience, I have always been touched that can describe beyond words. There is always a sentiment of gratitude lingering in my mind. I would like to express my sincere gratitude to my leaders for your concern and support, which provides me with the courage and confidence for today’s success. I would like also to extend my heartfelt appreciation for my team members for your unremitting efforts and strenuous striving for the honor of the Health Qigong cause. Finally yet importantly, I would convey my cordial gratitude for my friends for your encouragement and assistance, which render me considerable warmth that I will always engrave in my mind.